Disinterested refers to neutrality, a lack of partisanship, whereas uninterested refers to apathy, a lack of concern. Krishna is disinterested in the sense that he is not partial to anyone. He is the overseer of the world and he acts as a neutral judge giving people the karmic due for their actions. He doesn’t have any vested interests in promoting anyone or demoting anyone. Whenever people are promoted or demoted, that’s due to their own karmic actions. 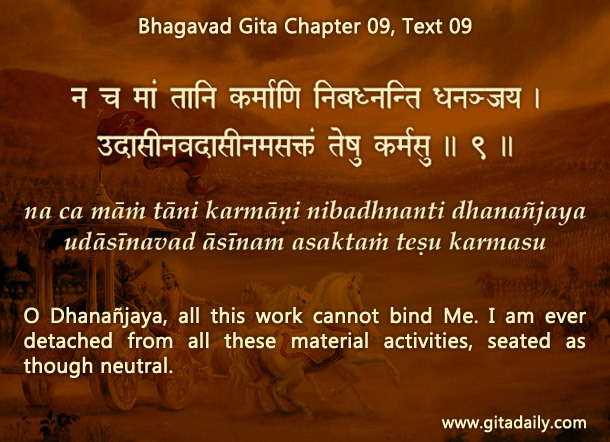 The Bhagavad-gita (09.09) declares the disinterestedness of Krishna in the material management of the universe. Yet the same Gita later (09.29), while reiterating Krishna’s disinterestedness, also stresses his special interest in his devotees. He is so concerned about them that it is as if they are one in love: he is present in their heart and they in his. Significantly, Krishna’s interest is not limited to his devotees alone. He is interested, immensely interested, in all living beings. Why else would he accompany them as the indwelling Supersoul – and accompany them lifetime after lifetime in their journeys through miserable material existence? His interest is not that of an over-vigilant overseer out to catch people doing wrong – his interest is that of a tireless parent striving for the return of his lost children. He doesn’t just await, but accompanies, the prodigal son. Through his indwelling presence, he acts as a concerned coach who prompts us towards our ultimate well-being through conscience, intelligence and inspiration. Even when we remain apathetic towards him, lifetime after lifetime, he never becomes apathetic towards us. Indeed, who can be more interested in us than him? By meditating on his interest in us, we can motivate ourselves to take interest in him – to understand his message, reciprocate with his love and thereby attain a life of eternal happiness with him.